Advanced Edge- Lock TM Paint Line Protector, a light bulb went off in my head and I decided that I would just paint some covers to achieve a simple striped look. I love how stripes are so crisp and timeless! Since Ikea is literally five minutes from my job, I swung by there after work to grab two of there inexpensive 20×20 white Gurli pillow covers and Fjadrar pillow inserts. Each cover was $3.99 and each insert was $5.99. Not bad considering one down pillow could cost $29.99 or more. 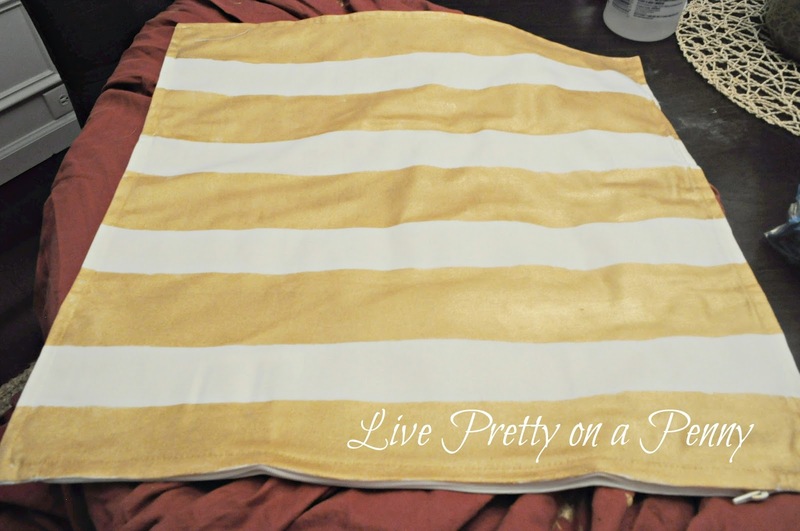 I then purchased gold fabric paint from Hobby Lobby for $2.00 after I used the 40% off coupon. To apply the fabric paint I used a disposable plate and good quality paint brush. 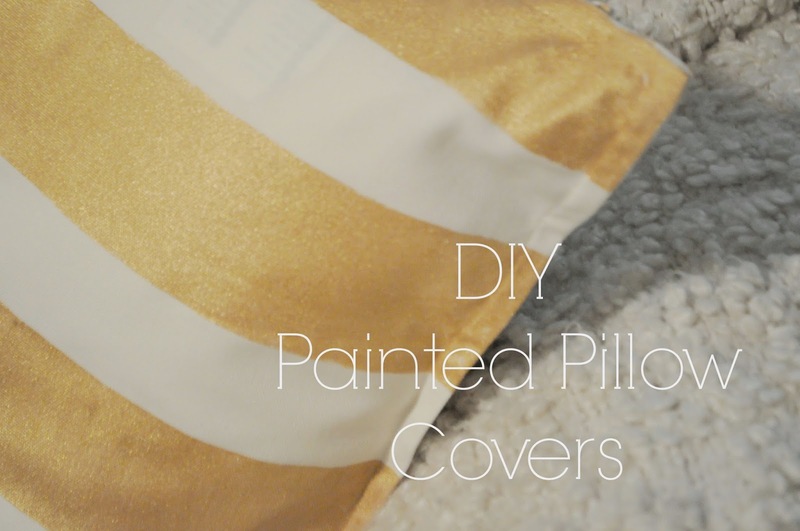 I started this project by ironing the pillows covers after taking them out the pack. They were pretty wrinkled! Advanced Edge- Lock TM Paint Line Protector accordingly. As you can see, my placement was not perfect, however I pressed the tape down to ensure that it was secure to the fabric. What makes this tape so special is its ability to deliver sharp lines, without any bleed through. That is important when working on a project, such as this one, where proficiency is key! After applying the tape and ensuring it was secure, I just lightly stroked in the areas that were not taped off. After painting all of the stripes, I removed the tape, as I feel it is better to remove the tape prior to the paint drying to ensure a crisper line. 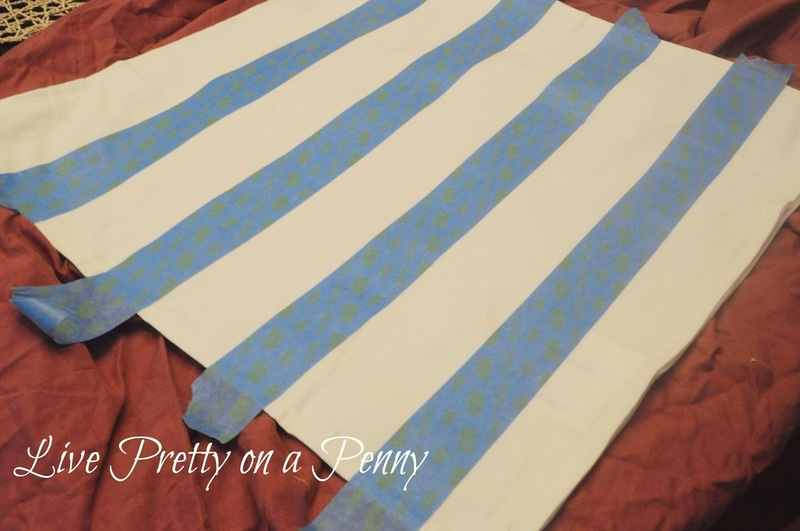 Once the tape was removed, I allowed the fabric paint to dry for another four hours, then turned the pillow cover inside out, and ironed it again. Here is what I was left with. 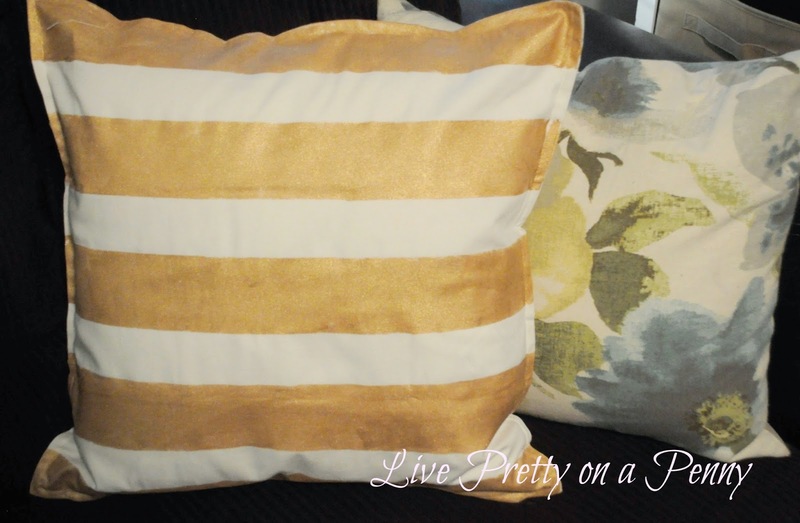 Beautiful, modern, crisp stripes and a nice addition to my existing floral pillows. This entire project from start to finish, not including dry time, takes less than an hour. Such a small investment of time, for a pretty impact. I hope to soon get around to doing full reveal of my family. I just have a few more touches to add. 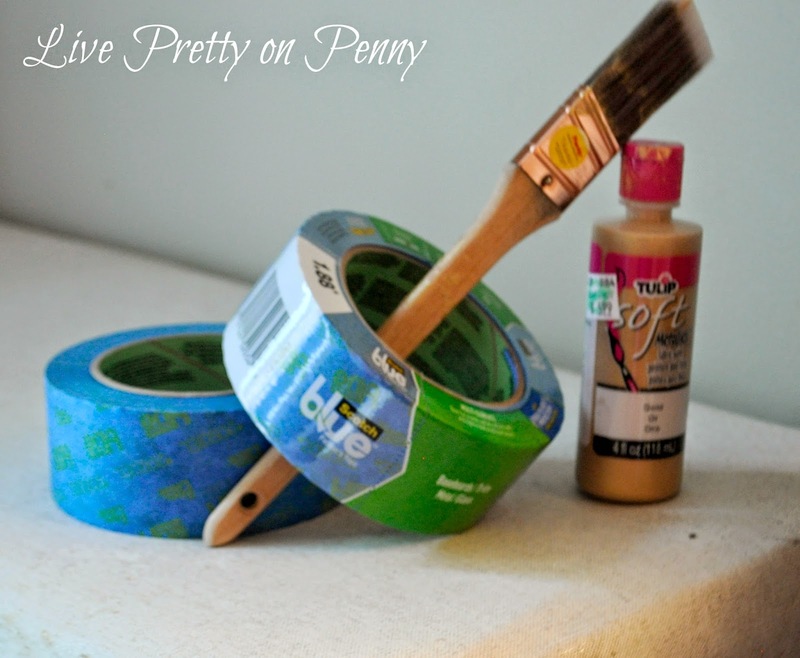 Advanced Edge- Lock TM Paint Line Protector to use and review based on any project of my choice. All opinions are my own. While we are on the subject of pillows, the winner of the Burlap Pillow Cover from SassafrasHome is Darnetha with ChippaSunshine. Congrats Darnetha, and you should receive an email from me soon! Love them. I told my daughter about them. Will have to pick her up a couple of the covers. 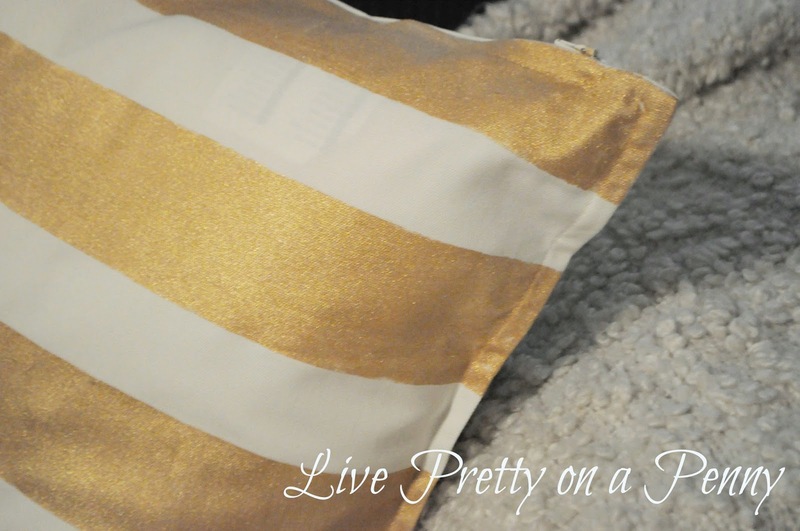 The pillows turned out so good and shimmery!